This indicates that there is a problem with the reverse proxy. Which mistakes could cause this and what should I check for? Where could I locate logs for the Nextcloud iOS app which would seriously help my debugging process? I have similar issues, except that I don’t get any error messages from the app in any case. Since I am also running a reverse proxy, I do wonder if the app login problem is somehow related to that. Would be nice to get an official response. Indeed… I found that clicking on “Revert to old login method” makes it possible to sign in, but an official bugfix would be great. Hi everyone, i recently set up my nextcloud to run with a nginx reverse proxy. 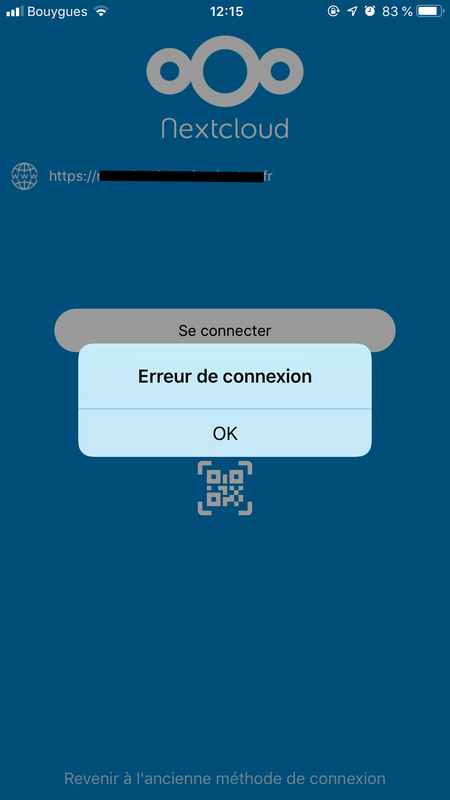 mynas.com/nextcloud is accessible but when i try to add the server to my iOS app, it says it cannot connect to the server… Any idea? Hi, i’ve installed a self hosted nextcloud instance with an reverse proxy before. Then i tried to connect with my iOS Nextcloud App but i got the error “Access Forbidden Invalid request”. I also tried to connect the app with an App-Token but this also doesn´t worked. Does anyone know what this could be? The linux client and as well the windows client are working properly. Thanks in advance! I installed a brand new nextcloud Official VM server from hanssonIT, everything works well with iOS App when open 80/443 ports on my router directly redirected to this VM. The problem is when ports are redirected to my Synology NAS using the intergrated reverse proxy to access the nextcloud portal. It seems that other people face the same probleme with a classical nginx revers proxy. To be more precise, everything is ok behind the synology reverse proxy through a brower, the problem is only with the mobile iOS App. Is anyone already saw/solved this issue ?